I knocked this up as a snack during the day yesterday. I had gone to the fridge to see what I could possibly make for dinner and there really wasn’t much in there. This week’s selection of recipes had yet to be ordered from Ocado so we were somewhat short of food. I did however have a lot of tomatoes! I couldn’t remember what I’d even bought them for and then remembered that Natoora had an offer so I’d bought them without a real use in mind. That said I love tomatoes so they weren’t going to be wasted. 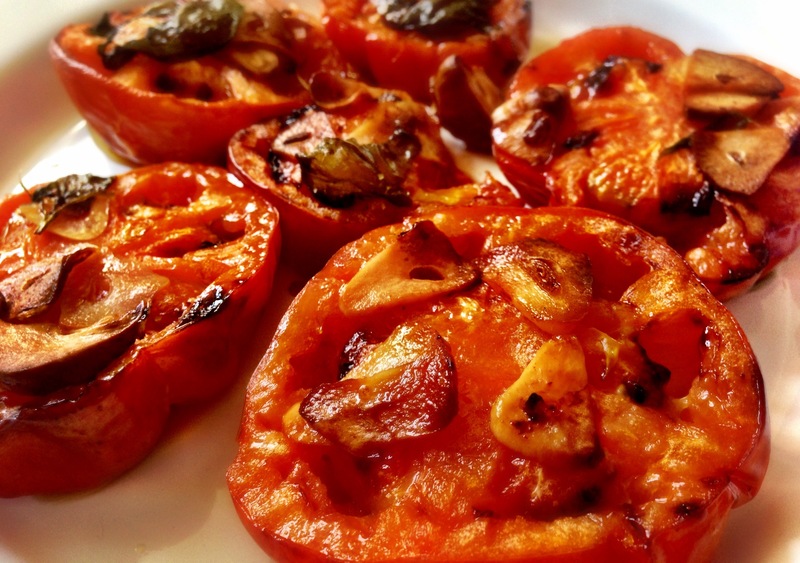 These Slow Roasted Tomatoes are from the ‘One Good Dish’ cookbook by David Tanis – and they are very easy – they just take a long time to be ready. Cut some tomatoes in half. 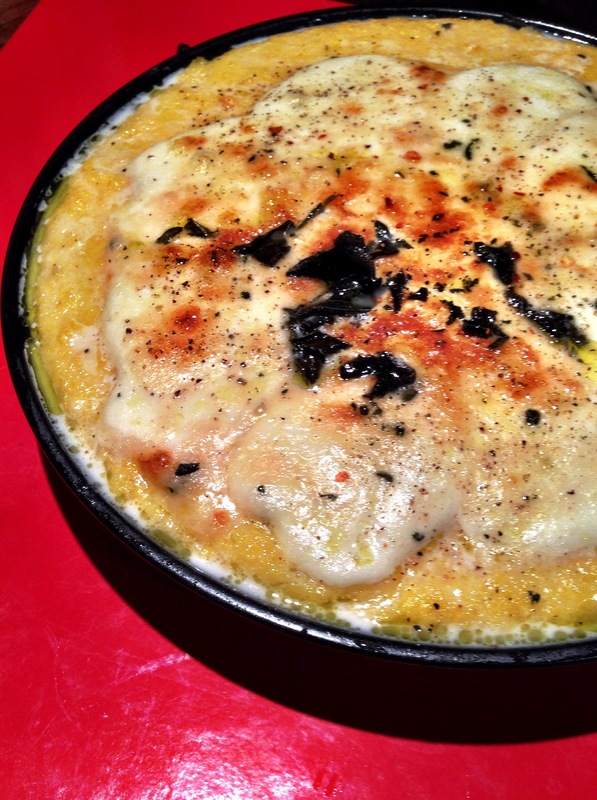 Drizzle with Olive Oil, Sliced Garlic and Basil and bake until they are done. I did them at 150 degrees C for and hour in a Halogen oven and they took on a really sweet taste. You’re supposed to have them with fish, but we just munched them while we waited for our ‘proper’ dinner to be ready. Tasty things don’t need to be difficult. This was easy – you just need good tomatoes – like Natoora! This won’t be ready for another 72 hours. Not sure what a not quick kimchee is – having never made one. But there you go. 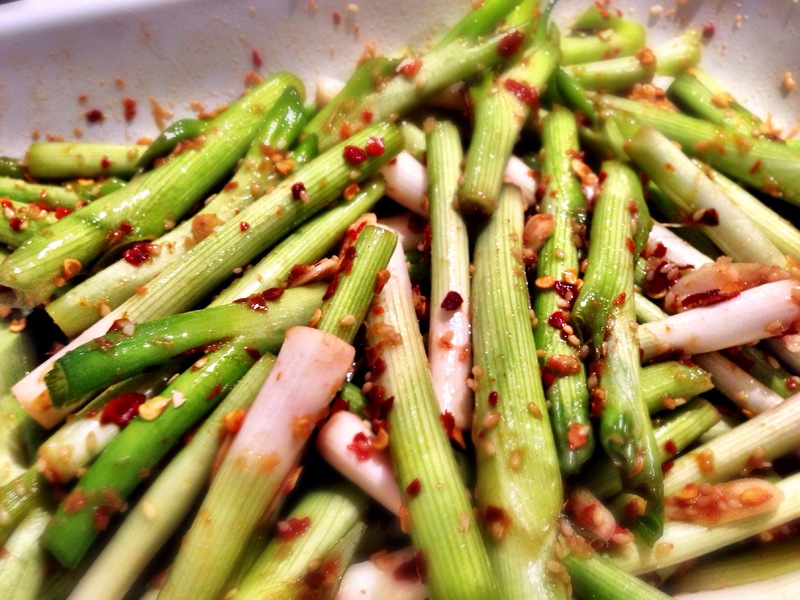 You simply trim several bunches of spring onions (scallions) and marinade in a dressing of ginger, garlic, chilli flakes, fish sauce, rice vinegar, brown sugar and sesame oil and seeds. I’ve never had this before but I’m guessing it’s going to have quite a kick given the amount of chilli flakes in it. Another incredibly quick and easy recipe to prepare from One Good Dish by David Tanis. We ate this after it had marinated for 3 days. Half a cup of chilli flakes is going to give you some idea of how hot is was! It would be lovely in a burger – or with something meaty. I had it ‘as is’ and it was a bit much! The leftovers I cooked in an omelette, and that was amazing! This isn’t cooking in any sense of the word. It’s cutting up some radishes and putting a blob of creme fraiche next on top. 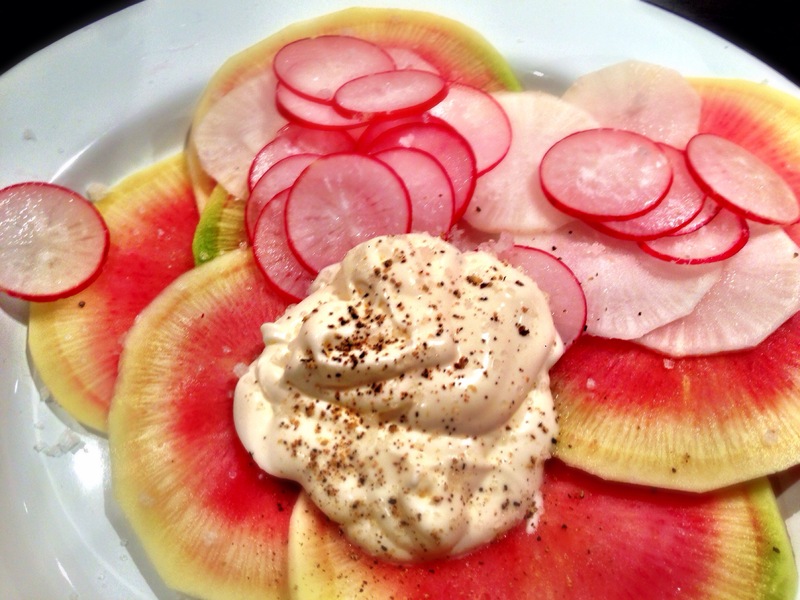 If you don’t have a watermelon radish, or daikon it’s not going to be particularly exciting. That said – if you do it really works ! The combination of the three radishes (salad, daikon and watermelon) offers different textures and crunches. Dressed with some whipped up Creme Fraiche and salt and pepper – this dish couldn’t be simpler or quicker provided you have a very sharp knife. You never know what you are going to get when you buy a watermelon radish. Sometimes they are really colourful inside and look amazing. Other times (like this time) they just don’t offer the amazing contrast on the plate. We cook with beetroot (red beets) a lot. It’s not unusual for us to have several bunches on the go at once. To think that as a youngster I assumed you only got this out of a jar in vinegar is quite unbelievable. It’s good to keep track of the times you eat beetroot. It does tend to colour ‘things’ a day later! More importantly, if you are cooking with fresh beetroot you have to be prepared to get red splatters everywhere and to gradually discolour all your chopping boards! Definitely keep the book you are following well away from them! 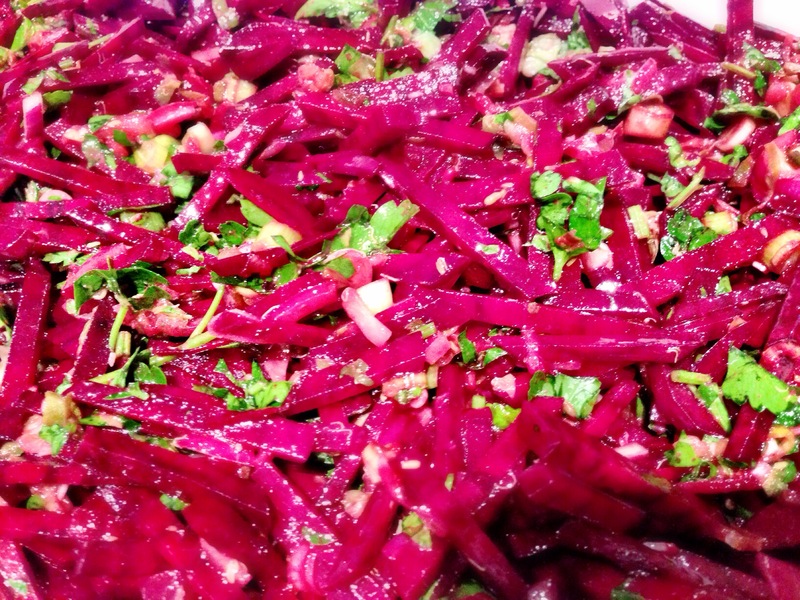 We typically roast beetroot in a halogen oven – then peel it and add it to dishes but this dish is with raw beetroot. If you are as unfortunate as I was – to get the smallest beetroots ever – you’ll find peeling them and julienning them to be very fiddly indeed. Bigger beetroot is better I think – although you can’t predict what will arrive in your online shop. This dish is essentially beef tartare with the beef substituted for raw beetroot. The dressing has capers, cornichon, parsley, dijon mustard, olive oil and spring onions (scallions). The recipe suggests serving with hard boiled eggs – which is convenient given I had two left over from the Egyptian Bean Salad! Looks beautiful doesn’t it! Marinate the beetroot in the dressing for a while and it’ll really come together beautifully. This is a great salad – but it can get messy – so be careful and don’t wear your best T-Shirt! I was going to hold off making this until the dried peeled fava beans arrived from souschef.co.uk but we happened to have a couple of tins of broad beans in our shop this week. I’m assured that fava beans and broad beans are the same thing but I’m not convinced. Anyway I made this recipe without the slog of boiling the fava beans for an hour and it came out pretty good. You essentially boil up the beans until they start to fall apart, add garlic and olive oil and cook some more. 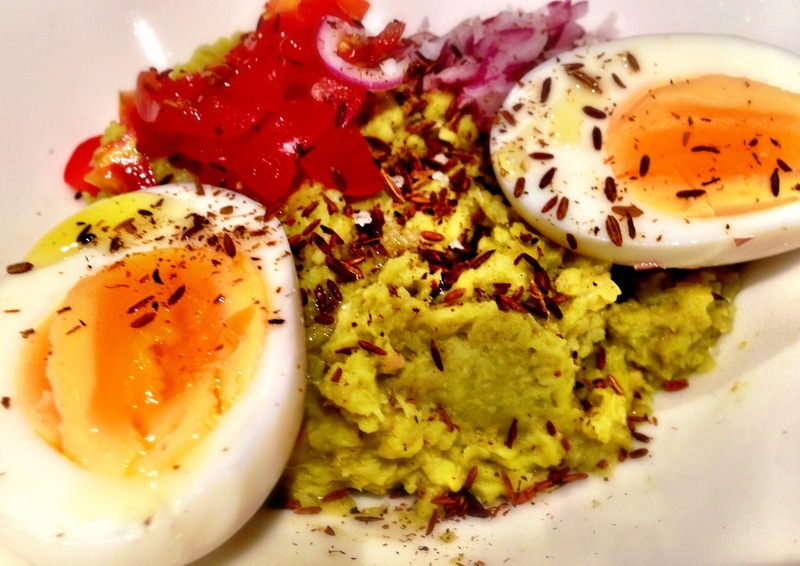 Serving is simply spooning it in a bowl and garnishing with red onion, ripe tomatoes and hard boiled eggs. The dusting of toasted and ground cumin seeds really finishes the dish off. I will make this properly when the dried fava beans arrive but the tinned beans variety wasn’t bad at all. Very filling and warming. We really like this kind of warm dish dressed with raw onions and chopped tomatoes. It’s like seasoning it with salt and pepper. This took less than 30 mins to make but I did cheat with the tinned beans. If you – like me – always end up with a bag of carrots in your fridge then this is what you should make with them. I love this – and it is so easy. Boil and simmer some carrots and when they are tender drain them and let them cool right down. Then make the dressing which as just enough ginger and garlic to give you a bit of heat but not too much that it overpowers the carrots. Mash the carrots a bit (I didn’t as I didn’t have a masher! 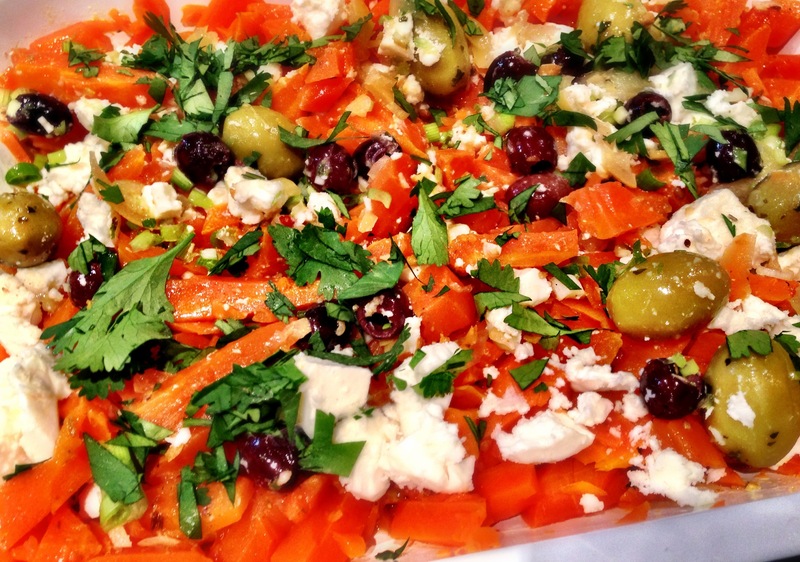 – I just blitzed them for 5 seconds in a Magimix) and dress the carrots in the dressing and top with mixed olives, feta and coriander (cilantro in the book) and optionally some spring onion (scallions) and preserved lemons. This really is a keeper – and I can’t imagine not having this every week. There’s loads left over too (there’s only the two of us) so we’ll have the rest for lunch at work. Hopefully the dressing with infuse even more with the carrots and it’ll be even better!